The Aspinal range of leather pen cases are ideal for keeping your most treasured pens from being scratched. 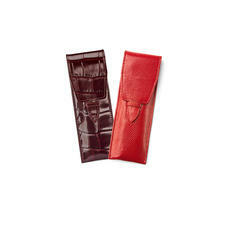 The small pen case is suitable for the more slender ladies pen and the Cathedral pen case can hold up to two large pens. Individually handmade in our workshops by our master leather craftsmen and available in a choice of Croc Calf, premium Jewel Calf or English bridle leather and sumptuously lined in Aspinal contrasting soft suede - all you have to do is choose your colour!